Will we be seeing more of The Deadman?! After The Undertaker made his return at the RAW After Mania, it left much of the WWE Universe wondering if it was a one-off for WrestleMania Weekend. Well, it seems that question has been answered after a change to Undertaker's non-WWE appearances and the news that Taker has signed a new deal and may very well be featured more heavily on WWE television going forward. At WrestleMania 35, Elias was interrupted by the Doctor of Thuganomics, with John Cena returning to his old gimmick and laying waste to The Drifter - both verbally and physically. Elias was obviously not best pleased that his Mania moment was taken from him and took his shot on the RAW After Mania to hit back with a rap himself. Elias made the mistake of saying that the next person who interrupted him would be a dead man - only to literally be confronted by The Deadman. The gong hit, sending chills down the spine of everyone attending and watching at home, before The Phenom made his way to the ring to deliver a Chokeslam and a Tombstone Piledriver to Elias - before crossing Elias' arms and holding him down while the WWE Universe chanted, "One... Two... Three!" - seemingly confirming Undertaker's next match. Yesterday, Inside The Ropes broke some disappointing news that there's been a drastic change to Undertaker's appearances in the UK on April 29th, 30th, and May 1st, with the Q&A with the Undertaker being scrapped, and Mick Foley stepping in - while The Deadman will still travel to the UK to sign autographs for the meet and greets on each date. It seems that there's now an explanation for this, though, with this morning's Wrestling Observer Radio confirming that Undertaker has recently signed a new deal with WWE, and that he may very well be brought back into the fold as a prominent Superstar. 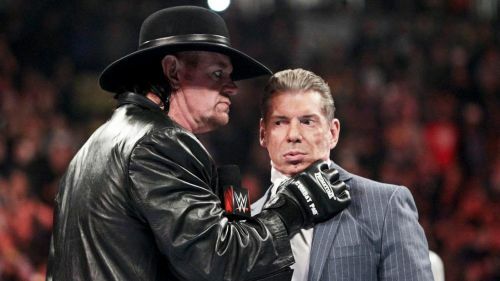 It's suggested that The Deadman's appearance at Starrcast II grabbed Vince McMahon's attention and caused some upset. Dave Meltzer reported Undertaker "pushed really hard" to keep his upcoming UK appearances, despite forces in WWE not wanting him to go at all. Only time will tell, but you'd have to guess we may very well see Taker back on television ahead of the Saudi Arabia show to further tease a match with Elias. Would you like to see Undertaker back in WWE regularly? Let us know in the comments.